Pentoir construction provides drywall, painting and insulation services to commercial and residential customer in Birmingham, AL. Robert (Jake) Barr implemented ShareMyToolbox and deployed it for nearly every employee in the company. “We have 40 people in the company and 35 licenses of ShareMyToolbox which covers everyone except a couple financial people.” It was important that everyone had the system because Jake wanted to change how people looked at tools. Before ShareMyToolbox was implemented guys would borrow tools from the company and keep them as they moved from job to job. Over time, they would slowly start to feel like the tools were their tools and at the end of jobs tools would go back to the employee’s garage rather than back to the company warehouse. 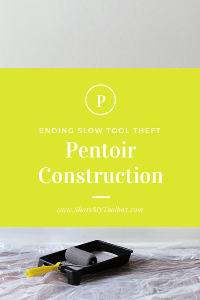 It was slow theft that steadily depleted the company’s tool inventory. Since putting ShareMyToolbox in place at the company Jake says “people’s attitudes have changed dramatically because they know they will get charged for the tool if it goes missing.” The slow theft stopped almost immediately as the guys knew that the company cared about the tools and was tracking where they were. Now each day the field personnel have to scan out their tools each morning. This slows down the morning rush as we work to get 30 guys out the door but it is worth it. By having to tap “accept” on their phone each day for the tools it is a daily reminder that the tools belong to the company not to the employee. This change in perception was the key to ending theft. When evaluating systems Jake and his team looked at several solutions. They were drawn to ShareMyToolbox because Jake felt it was the best way to change the culture at the company. The importance of tools needed to be understood from the top of the company to the bottom. The process for evaluating systems took almost a year for Pentoir. Jake started by downloading and testing ShareMyToolbox. He really liked it but wanted to be sure it was the best system for Pentoir. So he then spent several months watching demonstrations and testing other systems. He was also waiting for the right time to implement a system as he knew he needed the owner of the company to be fully committed to the process. Jake said “The only way this is going to work is if everyone is on board” and that is just what he got. ShareMyToolbox was put on every laborer’s phone. Everyone from the owner on down, must “accept” each tool they are assigned. Whether it is a tool assigned for one day or a tool that a guy keeps in his truck for weeks it is on his list. He sees it on the app and knows it is “borrowed” from the company. The daily “acceptances” changed the attitude around tools and that is what stopped the theft. Why did you want a tool tracking system? Did ShareMyToolbox help with theft? What advice would you give other companies looking at systems?